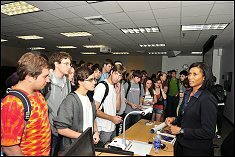 On October 23rd, NASA astronaut and Department of Aerospace Engineering distinguished alumna, Jeanette Epps (Ph.D. 00’) returned to Maryland to give a presentation to aerospace faculty, staff, and students. Her presentation, From a Terrapin to the Astronaut Corps, cataloged her transition from a PhD student in the Department of Aerospace Engineering to her current role as a NASA astronaut. Dr. Epps emphasized that confidence in your own abilities is a crucial attribute and encouraged anyone interested in being an astronaut to apply early and apply often. Immediately following her presentation, Dr. Epps signed autographs and answered additional questions. Dr. Jeanette Epps received her master of science degree and doctorate of philosophy degree in Aerospace Engineering from the University of Maryland in 1994 and 2000, respectively. Her graduate research involved extensive testing of composite swept-tip beams, comparative analysis of analytical models and experimental data for shape memory alloys and the application of shape memory alloy actuators for tracking helicopter rotor blades. After graduate school Dr. Epps worked for two years at Ford Motor Company as a Technical Specialist in the Scientific Research Laboratory. In 2002, Dr. Epps joined the Central Intelligence Agency (CIA) where she spent more than 7 years working as a Technical Intelligence Officer. In July 2009 Dr. Epps was selected as 1 of 14 members of the 20th NASA astronaut class. On November 4th, 2011 she graduated from Astronaut Candidate Training that included scientific and technical briefings, intensive instruction in International Space Station systems, Extravehicular Activity (EVA), robotics, physiological training, Russian language training, T-38 flight training and water and wilderness survival training. Thank you Dr. Epps for sharing your experiences and inspiring a new generation of Terps!